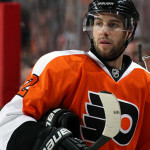 Simon Gagne has officially announced his retirement from the NHL after a 14-year career that had its fair share of brilliant moments, mostly with the Philadelphia Flyers over 11 seasons. Gagne had spent part of last season with the Boston Bruins after missing all of the 2013-14 campaign. 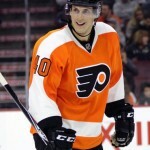 He eventually took a personal leave of absence from the team to be with his ailing father. Gagne then decided not to return to Boston, choosing to remain with family after his father’s passing. Gagne, a two-time 40-goal scorer, also spent some time with the Tampa Bay Lightning and ended up winning the only Stanley Cup of his career with the Los Angeles Kings in 2012, but he will always be remembered as a Flyer first. Gagne also won a gold medal with Canada at the 2002 Olympics in Salt Lake City.